Fantasy writing can be tricky but it’s hardly like rocket science is it? Why yes it is actually, and I should know, because I’ve done both. Now let’s get one thing straight. By rocket science I don’t mean the actual science of rockets. Surely we’re pretty good with rockets by now, so how much more does that leave to work out? However, what we do with, and on rockets, is a different matter. And I once worked on a project funded by the European Space Agency, all to do with growing plants in Space. Because if we are going to have anything like self-sustaining colonies in space they are going to need plants. So, how well do they grow? Well to find out you need to look at them, at the microscopic and the electron-microscopic level. 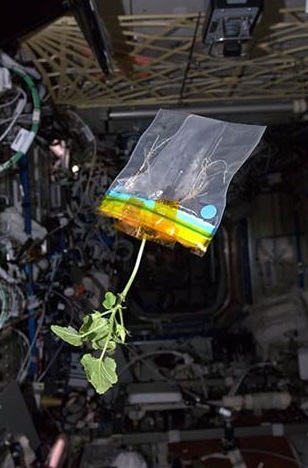 That means you need to ‘fix’ the plants as they were while growing in space. Such fixation is a standard part of the preparation procedure and involves some nasty chemicals, like aldehydes, because you are in effect chemically killing you plant as quickly as possible in a manner that enables you to look at it later. This is usually done by embedding the sample in a resin that is then sectioned to produce very thin slices viewable on the microscope. These are not the sort of chemicals you want sloshing around a space craft with astronauts aboard, or even to have as waste when an unmanned satellite comes down. I needed to look for other alternatives, in particular ways of making fixatives safe. I had a whole set of different candidates and experiments worked out. One evening while setting up an experiment to run overnight with a particularly nasty aldehyde I suddenly had an idea. I set up a new container and added to that a small vial containing a chemical accelerant that is usually added later to make a resin. Next morning I came back. To my delight, as I sort of expected but didn’t really think through, my aldehyde was now solid. It had formed its own resin thanks to the accelerant vapour. Wow, job done and all sorts of possibilities opened up. Many years later, in a different life, microscope hung up because this country doesn’t value research like they pretend, and I am writing the sequel to my first novel. I had the story outlined in notes and was following the ramifications through in the way you do when writing. It’s all going well and I am enjoying the ride along with Nicely and various new villains and situations, but it felt that perhaps something was missing. I then had a sudden idea, but it was getting late and I couldn’t quite see what would be involved. I wrote down a quick note, backed up, and closed down for the night. Typically the demands of being a full-time scriptwriter meant I couldn’t get back to the sequel for a while. When I finally opened the file, and found the note at the end, the full extent of what it heralded sank home. Wow, job done and all sorts of possibilities opened up! The fantasy aldehyde had become a resin – it was a game changer. And this is why fantasy writing is like rocket science. You can plan and set things out as much you like but sometimes inspiration will take you to a new place, one that you and maybe nobody else has ever thought of before. And that is pretty cool, whether you’re at the keyboard or in the lab. Next Next post: Vote for Fantasy and Science Fiction! Only we can save the future!